On August 21, 2018, Puja Thomson was interviewed by Wall Radio’s Van Ritshie to discuss her newest book, Track Your Truth: Discover Your Authentic Self. VAN: Now, tell us, tell us about your books. Now, now, you know, as I look at this, one of your books is entitled My Hope and Focus: Cancer Organizer, another one is My Health and Wellness Organizer, Roots and Wings: For Strength and Freedom, it’s a CD and Workbook, and Aftershock: From Cancer Diagnosis to Healing. All quite interesting books. PUJA: Well these started as, I was encouraged to write them as health resources because I was always focused on helping people to stay healthy from a holistic perspective. VAN: I kinda figured that out, yes. PUJA: So body, mind, emotions, and spirit. So, the first one was a CD of guided imagery and meditation because we can use our mind and we can use our imagination to help healing. And it was also for helping us understand our past. I chose the words “Roots and Wings” for my business as a matter of fact because in Scotland where I was brought up, it’s all about roots and when I came to this country it’s all about wings and space and outer space. And actually you need both: you need the roots to be grounded in your life and then you need from that grounded place you need to be able to take off and follow your inspiration and then move outwards. 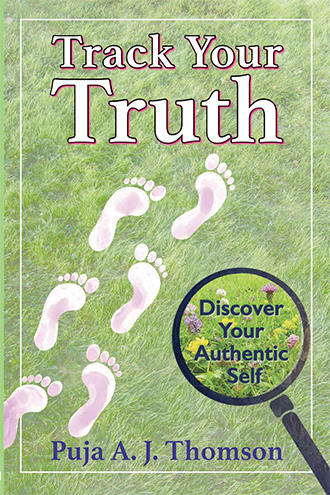 So, that is where I am grounded in roots and wings together and out of that the body, mind, emotions, and spirit, the inclusive perspective of using all parts of ourselves came for healing or for making decisions are now with my latest book to hone in on your truth and what’s true for you. VAN: You know what, I kind of go along with what you say and what you write. As a holistic healer, I am sure that is what you are yourself, I want to say this to you, and tell me if I am correct in my synopsis of this, what I am about to say: I am one who firmly believes that if you focus on something, no matter what it is, if you focus on something happening in your life, let’s say you want to change something in your life and you really, really focus that, you know you focus on changing and focus and just putting all these good adaptations into the back of your mind, into your subconscious, that it will eventually manifest on its own. Does the same hold true for holistic healing? PUJA: It does in a way that we have different parts of ourselves, and our culture tells us to use your head, think things through, and so if it’s only that that’s not enough. You need to allow the body to give you messages that tells you where something might be wrong and follow that through. And your enthusiasm and your non-physical senses can also help you. So, starting with the body that gives you messages and it can also give you messages about how you’re feeling through an ache and a pain, that could be literal, that could be overexertion or it could be that you’re holding onto an old hurt that gives you a pain in your body. And then also spirit, and that’s where intuition and hunch come in, and really seeing beyond the literal, physical, and mental, and emotional capacities. So, we have to get them all in balance, in a way. VAN: Makes sense to me, you know what I understand that, sure. So, you can have a combination of holistic healing methods in the way of natural, foods whatever it may be, foods, vitamins, etc., etc. etc., combined with a strong mental outlook, you know, focused on what it is that you are trying to do with your body. If you combine them, you have a much better chance, I would think, of accomplishing what you set out to do. PUJA: Yeah, there’s an energy principle that says: whatever you feed grows larger, whatever you starve shrinks. So, we often emphasize a particular part of ourselves, so some people wallow in their feelings and other people need to pay attention to their feelings. So, if you are too much of one to the exclusion of the others, then, it’s not so healthy. And food and so on is an important part of being holistic. VAN: Now, it says here, future readings in the pipeline. Now, you refer to readings instead of like, a seminar? PUJA: Well, I do seminars and readings. If it’s at a library, people are coming to be introduced to my new book, so it tends to be a reading and an explication of how the book came about and reading some introductory parts of it. Now, if it’s a seminar then they will be coming and going and interaction between the participants and working through the themes. VAN: Okay, you have some readings coming up in September for Retired Men of New Paltz and then you have the Study Club of New Paltz on the 11th. And one of my favorite places in October, on the 7th, you got the Gardiner Library. You’ve got the Warwick Library reading coming up on October 8th and Oncology Support Program in Kingston on the 23rd. That’s all very interesting. PUJA: That’s kinda combing the theme of the new book, Tracking Your Truth, applying it to tracking your cancer journey. VAN: So, this is your latest book then? Track Your Truth? PUJA: Yes, new last month. VAN: Okay wonderful! Well, you know what, I want to wish you all the very best with this! I just opened it to a random page, and I see two categories: one is Get a Gut Reactions, Heartfelt Feelings, and Blind Spots, and the other is Health, Wellbeing, and Wholeness. So this, I can tell you right now, this is a book that I am definitely going to read because I like stuff like this, I really do. PUJA: Well I love detective stories, so it’s applying the being a detective to your own life. Because a detective is tenacious, they have to be open to all possibilities and they have to start with where the clues are and follow the clues and even see what the culprits are. So, that’s what I am encouraging people to do in their own life because there are so many distracting voices that take us outside ourselves, you know? And so, this is to help people focus back inside themselves and to their own experiences and their own truth. VAN: For me a lot of those distractive voices come at night sometimes, when I am trying to fall asleep. I can’t believe what goes on in my noggin sometimes, you know really? Anyway, I want to wish you all the best of luck with your new book. Is there anything else you’d like to add? PUJA: Well, I’d just like to add that we do have, we can take responsibility and while this book can be for young people setting out, it can be for older people because it’s like we live three lifetimes now within one lifetime so that exponentially increases our capacity to go through change. So I am encouraging people to welcome change into their life and trust their own truth. VAN: That’s wonderful, that’s very well said actually. Where is your book available? PUJA: Well, it’s available from me, it’s available in book stores, it’s available on Amazon, it’s also an e-book, so one could go online to get it. It’s the first e-book I’ve done. It can be on Kindle or other e-books. VAN: Track Your Truth is the name of the book folks. You know what, if you’re into this stuff, it’s kind of a must read for you, you know, get it. I’m sure you’ll enjoy it, I’m looking forward to reading it myself. And Puja Thomson, I want to thank you so much for coming in and being with us on the air. PUJA: Well, it’s been a pleasure Van, I’ve enjoyed this conversation. VAN: Thank you so much, and you have a wonderful day. With the leaves descending from the trees with hues of orange, red and yellow, the wedding season has also come into full color. I am fortunate to unite couples from many different perspectives and walks of life who wish to pledge themselves to one another in marriage. They enjoy working with me to co-create a ceremony that is meaningful to them, thus making their special day as unforgettable as possible. Creating a personal experience in this way has produced many many memorable days over the years. by Maggie Heinzel-Neel of another wedding I officiated. The weather has been generally fabulous this fall. But there have been days when I remind a couple if disappointed that the sun isnt shining, that indigenous cultures see rain as a blessing, which washes away and purifies the past so that a clear new future can unfold. I had the pleasure to attend a career fair this week at SUNY New Paltz with the hopes to find interns who wish to find more experience in the publishing world. I got a chance to speak with a number of students with an array of talents from editing to graphic design. It is always a treat to be on the New Paltz campus as I am able to connect with a variety of different people, in an effort to spread awareness of the importance of health and wellness. Overall it was a great turnout as many students seemed interested in learning more about the positive influence health and wellness can have on your life. I'm thankful for any opportunity I get to interact with the community of New Paltz and I look forward to contacting students to intern. I was lucky enough to attend the People's Climate March held this Sunday in NYC. I was one of 300,000 people in what is being called the largest climate-change demonstration in history. Demonstrators marched with the intent to bring awareness to the effects global warming has had on the planet. I was lucky enough to visit my home country of Scotland this summer and something I got to experience was the impact of the controversial referendum vote on Scottish independence. It is only a few days away now on September the 18th and currently it is too close to call. Issues are very complex and will affect the entire British Isles. As I made my way around Scotland, I noticed the 'YES' campaign as being very outspoken and pushy. There were many loud colorful signs and even a merchandise shop which promoted the idea of Scottish independence. While the ‘NO Thanks’ campaign seemed much more restrained. I noticed subtle signs across Scotland that were not as aggressive but still made a statement that there were campaigning against voting for independence. But, as many Scots consider voting to be a very private personal matter, many are not likely to reveal what they will vote and may vote no. "When I was a kid, around five or six, my biggest dream was to be a veterinarian—everyone always observed that I was good with animals; I loved animals as much as they seemed to love me. More than that, I was interested in healing those who were hurt. I was strongly affected by negative emotions and any sort of discord, and while I shied away from the idea of healing people, I wanted very much to help animals, who’d brought me plenty of joy and amusement during my childhood. As I grew older, I found that I wasn’t as cut out for veterinary training as I’d once imagined—I wasn’t very good at science and math, foundations any doctor would need, but fortunately, I did have another strong suit. Another childhood passion of mine was reading and, after fourth grade, writing. As a young girl, I was enthusiastic about and absorbed by fantasy and science fiction stories. I soon began writing some of my own, modeled after the books I loved most, by authors like Bruce Coville and Mary Stanton, and such epic series as Star Wars and Lord of the Rings. I was encouraged by the fourth grade teacher who first told me my writing had a real “voice,” and my supportive mother and stepfather. When I reached my last year of middle school and entered high school, I discovered that my love of language also opened up another door for me—like my mother, I was a good editor. Peer-editing my classmates’ papers in a college-level English class, and being commended by my teacher for the help I was giving students who needed it, I decided on my future career path. I knew as early as eleventh grade that I wanted to be an English major, and my determination certainly surprised adults who were used to students who were undecided! At SUNY New Paltz, I learned to extend my range as a writer and an editor; I took Journalism classes in addition to my English classes, and my minor in Journalism requires an internship in a communications field, such as publishing. I knew I wanted a position that would help me grow as a writer and an editor, as well as one with a specific geographical component: I wanted to stay local. New Paltz, as a community, has always welcomed me and made me feel safe; I feel much more grounded here than I would have in New York City or on unfamiliar parts of Long Island, my home. Puja’s listing in the job fair catalogue called my name right away—not only was it in the New Paltz area, it was seeking someone with the skills I had and wanted to hone. It seemed like a dream, but I was still nervous; I’d been disappointed by seeming “dream jobs” before, overlooked in favor of other candidates. I tried to pour my nervousness into something other than needless stress: the hunt for the right black pants to wear to the fair, the right résumé paper to print my qualifications on. The day of the job fair wasn’t nearly as stress-free as I’d been hoping—the humidity was awful and I lugged my six-pound Shakespeare anthology to class only to find out my professor had unexpectedly cancelled. By the time I got to the job fair, I was hot, upset, and slightly panicked, and I was sure that whatever chances I’d had at being hired had surely slipped down the drain! I remember being so relieved after my interview—I liked Puja and she seemed to like me, and even the unfamiliar subject area I’d be working in didn’t seem quite so daunting after our talk. I waited nervously to hear whether I’d gotten the position or not, and was relieved and excited when I opened my inbox one Saturday morning to an email from Puja informing me that I’d be working at Roots & Wings along with another intern. Since January, I’ve been greatly enjoying my work at Roots & Wings. I’ve been opened to so many new experiences—I’ve been editing manuscripts and seeing how layouts are formatted (and reformatted), and learning about how to write book proposals. I’ve even found that working with writing on health and well-being resonates with why I wanted to be a vet as a child—it’s all about cutting down on pain and negativity. The idea of “roots and wings” even applies to why I wanted this internship in the first place: I wanted to allow my New Paltz roots to flourish, and the knowledge and connections I gain here will hopefully allow me to spread my wings and take off into the professional world!" , One way I keep my own energy moving is to connect with younger people at other points of the age spectrum. I love to mentor SUNY student interns through the publishing aspect of Roots & Wings. It can be a reciprocal win-win for us all: interns have a hands-on learning business experience, practicing essential skills, while their perspective can be very helpful to me. “Take a moment and close your eyes; picture yourself at age ten stepping into an amusement park for the first time. You are overwhelmed by the lights, the music, the rides seeming to break all laws of physics. You are excited yet scared at the same time, but not to worry, your parents are right there holding your hands. This scenario is pretty much exactly what I felt the first time (and many times after) I stepped into a career and internship fair. The chills that ran through my body were only numbed by the fact that I knew I was not alone. There were hundreds of other students just like me waiting to start their lives. I knew this could finally be my big break. At first I was a little worried at what I could possibly do to improve this one-woman company. I quickly found out that even though Puja is the sole proprietor, there is so much work to do! I am never bored. The most fun assignments are when I get to edit her material. I remember being so completely satisfied with myself when after I sent her some edits, she ended up going with most of my suggestions! It’s truly the best feeling ever, feeling that you did something worthwhile. I’m learning a lot also. I’m more aware of writing clear and concise sentences than I was before, especially for the type of self-help books Puja is writing and publishing. You must use colloquial language and organize it in a way that easy for readers to understand. Editing is truly an art form and must be done with a careful eye. As I have learned, good editing is what truly makes a good book. Roots & Wings Interns Spring 2013 - Lauren on left; Tracy on right. Past entries of Puja's blog for the Chronogram magazine can be found here. She is no longer writing a blog for Chronogram, but some of the entries may be of interest. There have been some changes in the management of this blog. Puja would like to thank Cynthia Stewart for her contributions to the entries in 2012. Puja is busy expanding her My Hope & Focus Cancer Organizer, which is near to completion. Look out for other posts to come!